In a May email, Dallas County Elections Administrator Toni Pippins-Poole revealed a sliver of the problem after Huffines requested data. The Dallas County District Attorney’s office has been unable to confirm to WFAA whether it has received any complaints from the Dallas County Elections office or prosecuted any of the 22 non-citizens. The revelation is interesting – not only because it’s happening in the country’s largest Republican state – but also at a time when questions remain about Russian meddling in the 2016 presidential election. “I can’t imagine many Americans thinking non-citizens should have a say in our election,” Huffines added. On its website, the Texas Secretary of State reports each month the number of voter registrations it cancels because someone admits he or she isn’t a citizen. But the real number is likely much higher because these figures only represent people who self-report after receiving a jury summons. The potential jurors check the box on the back of the summons to disclose they are not a citizen and need to be excused. Only then, does the state discover their citizenship status and cancel their voter registration. 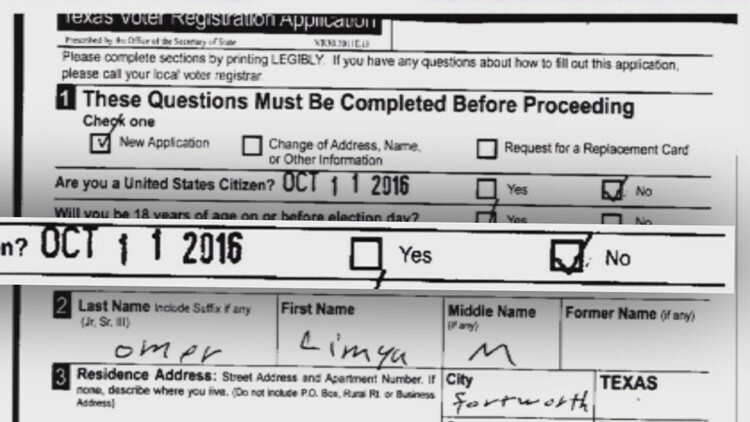 But how and why are non-citizens registering to vote in the first place? That question – focused on the lack of oversight and better diligence on the front end – is a little harder to answer. There’s no evidence yet of fraud. Instead, it appears the bureaucracy is partially to blame because the state registers many of these non-citizens to vote when they get an ID card or driver’s license. Take the case of Ayodeji Adebayo in Hurst for example. Tarrant County canceled his voter registration. But on his original application, Adebayo checked the “no” box declaring he is not a U.S. citizen. Yet, the state still registered him to become an eligible voter. Same story with another woman in Fort Worth named Limya Omer. She admitted that she was not a U.S. citizen, but Texas added her as a voter anyway. “There’s no question that there’s large numbers on the rolls but I couldn’t speculate as to how many,” Joe Vanderhulst, an attorney with Public Interest Legal Foundation, told WFAA. His organization – based in Indianapolis – investigates election integrity across the country and identified Adebayo and Omer’s cases locally among others. His group currently is in a federal legal dispute with Harris County where the chief elections official has argued in court filings that she is under no obligation to remove non-citizens from voter rolls. The Texas Secretary of State told WFAA that it is taking steps to clean up the voter database and identify how many people on it are not U.S. citizens. “The Texas Secretary of State’s office has been working diligently with the Texas Department of Public Safety to obtain the type of data our office is permitted to provide to counties so that they may investigate potential lawfully present non-citizens who may be on their voter rolls. As always, our office will continue to exercise our authority to the maximum extent allowed under current law to ensure the integrity of the voter rolls in our state,” said Sam Taylor, a Texas Secretary of State spokesman, in an email to WFAA.